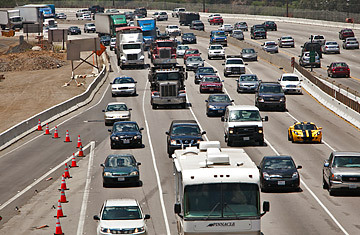 The 405 freeway in Los Angeles, seen here on June 28, 2011, is preparing for a two-day closure July 1617 that is being called "Carmageddon" by Angelenos. To hear Angelenos talk about the news, you'd think we were bracing for the Big One. Or maybe preparing for something worse than the dire stretch of earthquakes, floods, fires and riots that hit us in the 1990s. Celebrities in Los Angeles are tweeting about the calamity; hospitals are up in arms about it; local news channels are calling it "Carmageddon." What could cause so much panic? If you live in L.A. and you don't know what I'm referring to, the next sentence may lead to more stress in your life. It's the 53-hour-long shutdown of part of the 405 freeway from the evening of July 15 through July 17. A road closure? On a weekend? All this distress over that? Well, it's not just any road. It's the 10-mile (16 km) stretch of concrete that connects the west side to the San Fernando Valley. It usually carries half a million people on the weekend, making it one of the busiest sections of one of the most dreaded roadways in L.A., home to the U.S.'s worst traffic. During the closure, construction crews will demolish the south side of a bridge, which will allow them to widen the freeway and add carpool lanes. They will rebuild the bridge over the next 11 months and then shut the freeway again to repeat the process with the north side of the bridge. Officials are predicting backups of 32 miles (51 km) in each direction over the July weekend; they could be as long as 50 miles (80 km) in the worst-case scenario. Surface streets in the area, many of which snake up and down winding canyons, will be jammed. "We're hoping that the message that has been put out repeatedly will take root with everyone that drives and they will stay out of the area," says Kirk Albanese, deputy chief of the Los Angeles Police Department. "But recognizing that that may not occur, we're planning for the very difficult traffic circumstances that we may be faced with." The anxiety this is causing around Los Angeles is a reflection of the intimate, love-hate relationship we have with our freeways. People love their cars in this spread-out metropolis. Public transportation, carpooling and walking are often shunned, which makes the freeways a central part of Angelenos' lives. Ginger Chan, a traffic reporter for the local television station KTLA, says she even flirted with someone in bumper-to-bumper traffic once. "I have had that happen to me, where some guy is trying to get my attention and we're both smiling at each other," she says. At times, to hear us talk about the freeways, you'd think they were our most prized possession. A friend who recently moved to L.A. from the East Coast noted that if he's at a loss for words at a party, he can always strike up a conversation about traffic. If you want to do this and you're from out of town, some important points. First, they're "freeways," not "highways" or "toll roads," as they are in other parts of the country. Second, L.A. lingo dictates that a freeway must be referred to with the article the preceding it. You don't take "10 West" or "Interstate 10"; you take "the 10." Another friend from the East thinks the implication with this is that L.A.'s freeway is the only one, or at least the most important one; as if "the 10" that goes through L.A. is more special than the rest of Interstate 10 that stretches across the country. Our traffic lingo doesn't stop there. We also have the SigAlert. According to the California Department of Transportation, or Caltrans, the term came about in the 1940s when police became accustomed to notifying local radio reporter Loyd Sigmon about car accidents in the city. Caltrans adopted the term to mean a wreck that ties up two or more lanes of a freeway. Today the term is so common, you can go to sigalert.com to check the status of the freeways. That brings me to the hate part of the relationship. We know traffic is inevitable, but we abhor it anyway  and can't stop complaining about it. An Angeleno trapped on a freeway by a SigAlert is likely to compare his fate to a human-rights violation. Check out sigalert.com on a given Friday afternoon: you'll see a lot of red lines. Those freeways are jammed. We pray for some yellow. Green would be an absolute miracle. Chan at KTLA likens the freeways to Murphy's Law, the adage that if anything can go wrong, it will. They're "the only way to get to certain places, so they're always jammed," says Chan, whose husband pilots the station's traffic helicopter. "I rarely get stuck, because I can't stand it. It's like pouring acid on me. I always say, I will drive in bad neighborhoods, I will cut you off, but I will not get stuck in traffic." Everyone from local officials to actors are trying to help people avoid just that during the shutdown. City websites are featuring countdowns to the closure as if it were the run-up to an election night. Actors Ashton Kutcher and William Shatner have sent Twitter messages about it. GPS companies have programmed their systems to inform drivers about it. Officials have announced they'll offer free bus rides. Freeway signs as far as 70 miles (113 km) away are warning drivers with all-caps messages: "EXPECT BIG DELAYS." A website called "The Carmageddon Resistance" is encouraging people to download a traffic-navigation app for smart phones. But if you find yourself in 405 traffic on the dreaded weekend, make the best of it. You might even find a date, Chan says. "I don't know anybody who's actually met on the freeway while being stuck," she says. "It could happen on the weekend of the 16th and 17th."